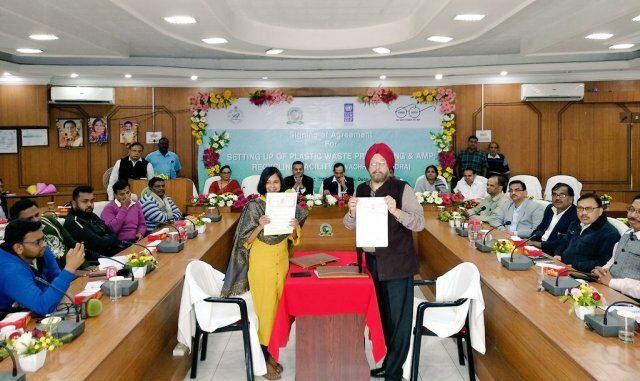 ONI Bureau: With an effort to manage plastic waste generated in urban local bodies, the Bhubaneswar Municipal Corporation (BMC) on Tuesday signed an agreement for setting up a sustainable plastic management system in Bhubaneswar by January 2019. A MoU has been signed between BMC, United Nations Development Program (UNDP) and Hindustan Coca-Cola Beverages Limited for establishment of a 6,000-sq ft area Swachhata Kendra near Sainik School for transport of solid wastes. The Swachhata Kendra will recycle all types of plastic materials, polyethylene, high-density polyethylene and low-density polyethylene. Initially, the project will implement in ward number 12, 13, 16, 25, 27, 30, 34, 40, 41 and 53 under the BMC. 5 MT all types of plastic wastes will be collected from the wards per day. Later the project will be implemented in all wards of the city.